This has always been one of my favourite beer glasses that I'd managed to find in an op-shop. Naturally when I saw the beer I had to get it even just to give it a go. Hopefully the beer that goes with one of my favourite glasses lives up to the glass. So an Eisbock is a very distinct style of beer from the district of Kulmbach in Bavaria, Germany. Basically it is made by partially freezing a doppelbock and removing the frozen water. This inturn increases the alcohol content and concentrates the flavour of the beer. Being a Schneider Weisse beer this is an example of the style is actually made from freezing a Weizen-Doppelbock, technically making this a Weizen-Eisbock. Anyway I digress, lets drink this! Never having seen an Eisbock before I am going to assume that this beer is supposed to look like a normal Doppelbock. The beer is a dark brown colour with a large tan head. There appears to be high carbonation, which helps with excellent head retention for a beer with such high alcohol content. The lacing is average but this may be due to the frosted glass lower down which seems to have much less friction. It's a nice looking beer. 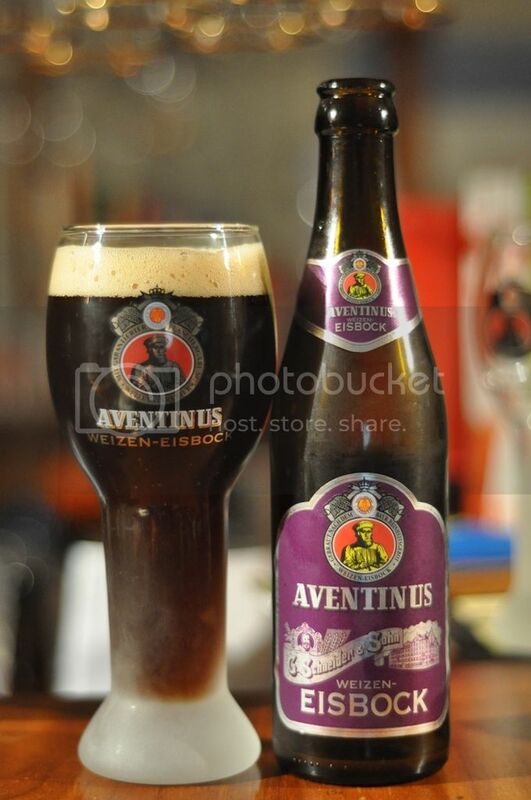 This is an incredibly aromatic beer, with what I can best describe as three complex layers of aromas. Firstly there is a fruity layer with dark fruits and that distinct Schneider Weisse banana ester. I am calling the strong cloves smell it's own layer as it completely overrides the fruity layer and prepares the nose beautifully for the last phase a nice caramel and bready malt bed. It smells sensational, this could be a fantastic beer! When tasting this beer you are firstly hit by the incredible sensory overload. There are just flavours everywhere! The dark fruits that were so evident in the smell become clearer, with strong plum and raisin flavour, before the standard Schneider Weisse banana flavours and incredibly strong cloves come through. The malt finish is bready with mild roasted caramel elements, as well as a slight spiciness that I can't quite put my finger on. Quite simply brilliant! What a sensational beer! This beer is probably in the top 10 beers I've ever had and thats a big call! The flavours are strong while not overpowering each other. They actually compliment each other extremely well considering how strong all of the flavours are. The mouthfeel is quite light considering the high alcohol and large levels of roasted malts. It's a simply brilliant beer, I love it almost as much as the glass. I'll be getting more, and you should to if you come across it.